Next Civic (Special Called) Meeting - Tuesday, July 22, 2014 / Riley Chambers Center @ 7:00 p.m. CHECK COMMUNITY CALENDAR FOR OTHER IMPORTANT DATES !! Congratulations 2012 - 2013 Scholarship Recipients! The Civic League also works with other key community organizations, such as the Ministerial Alliance, various churches, local schools, MUD #50, the Barrett Station Health Advisors and the sports association in getting important news and announcements publicized and distributed within the community. As the ultimate "voice of the community", the Civic League believes that its most crucial role is the ability to listen, hear and respond to those issues that may adversely affect the lively hood, health, safety and socio-economic balance within the community. 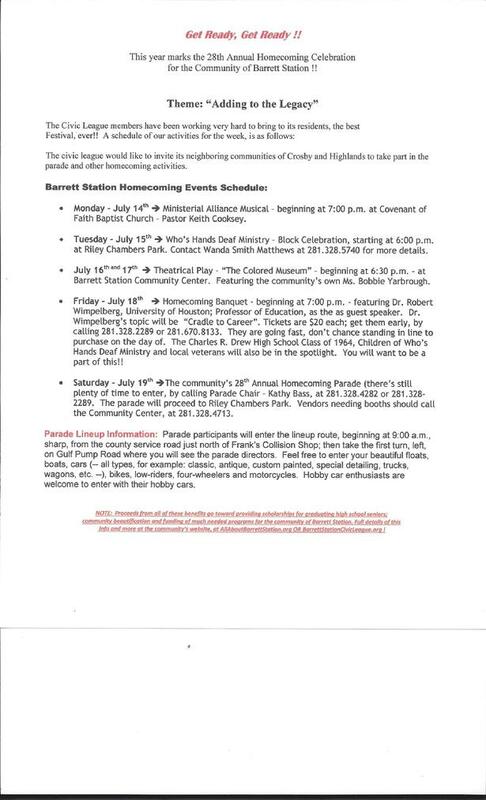 Some annual activities and/or events in which the Civic League participates or sponsor include: the Spring and Fall Cleanups, the Yard-of-the-Month Contest, the Annual Homecoming and parade; the (newly organized) Drug March; and award of scholarships to deserving high school seniors. 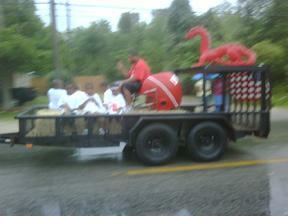 Highlight Photos From Homecoming 2011 !! 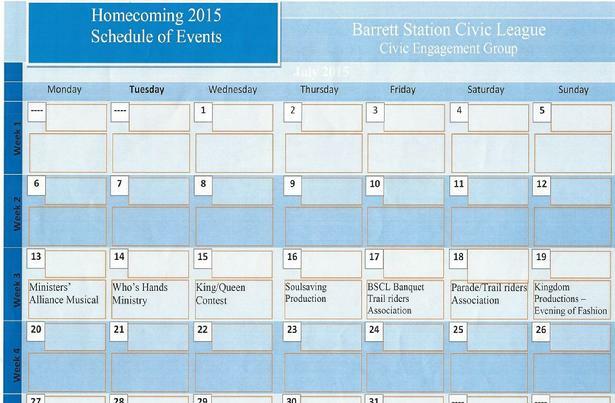 Become a Member of the Barrett Station Civic League, Now! Why not think about becoming a member of your local civic league today? Annual dues are $12 per person; or $6 for persons 65 and over; and, $25 for business and non-profit organizations. Only paid members may vote at monthly meetings. Memberships expire on December 31st of each year. New memberships paid after July 1 expire on December 31st of the following year. Your support demonstrates your vested interest in the community and, indeed, the continued success of the Civic League’s efforts in sponsoring community projects (such as our community cleanups; scholarships for our children; annual homecoming celebrations; our planned street lighting project for 2012; and, our yard-of-the-month program). With supporters like you, the BSCL’s mission will only continue to grow in strength and scope. 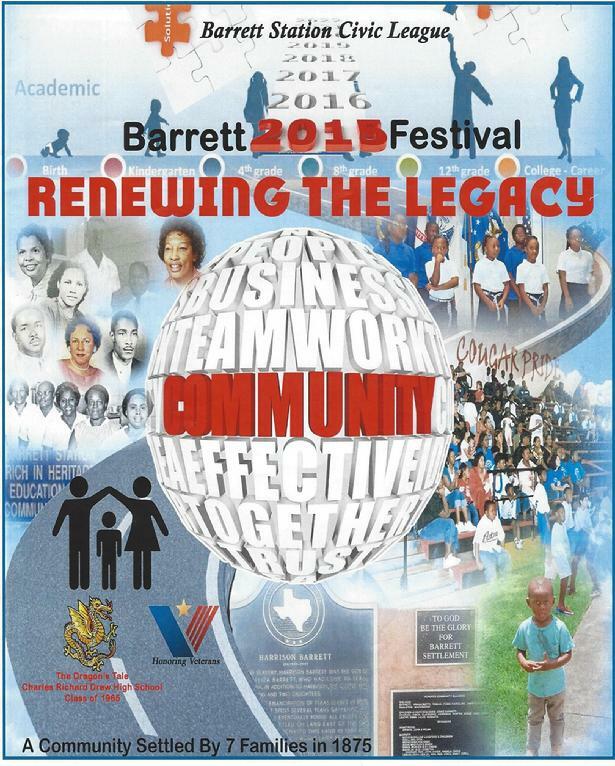 The Barrett Station Civic League is a 501(c)4 non-profit organization.